Why do we need clocks? "So we know when to sleep and when to eat." 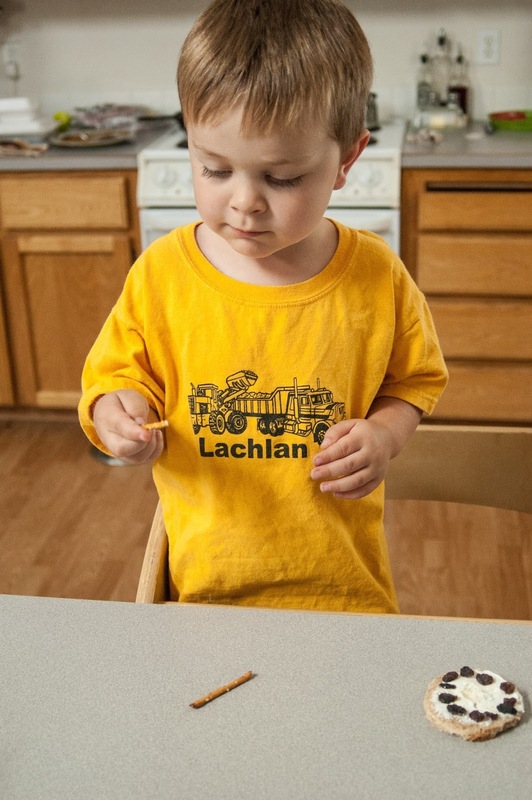 Lachlan said. 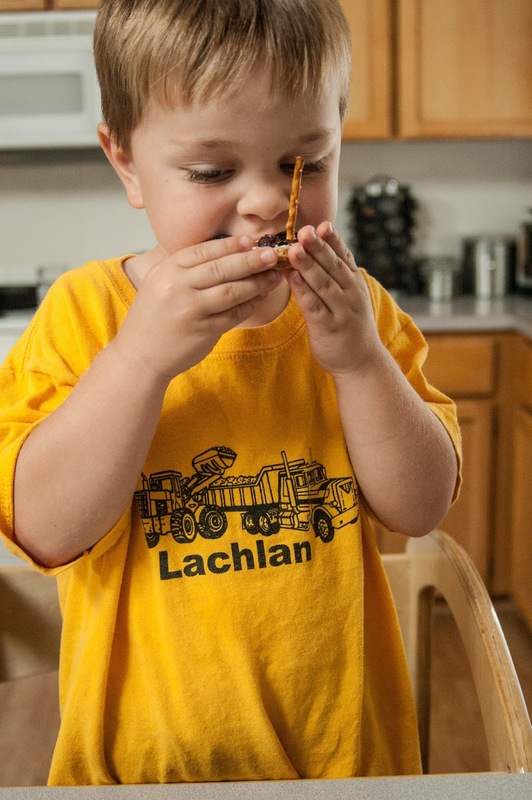 We did a lot of today with just Lachlan and I while the others were taking naps. I do love to have one on one time with him, exploring and learning and well, just having good quality time together. 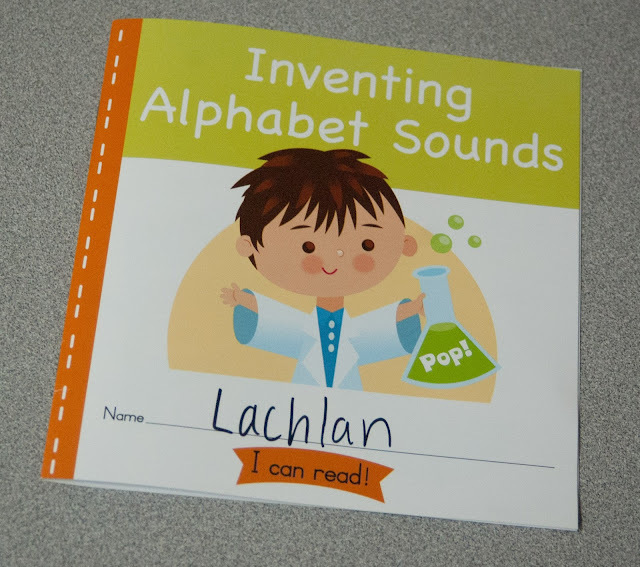 Before nap time we explored the book that came in today's day bag - Inventing Alphabet Sounds. Not only does Mother Goose Time provide a published children's book for each month but they often have their own printed little books that come with the kit, one for each child and a place to write their name on the front. 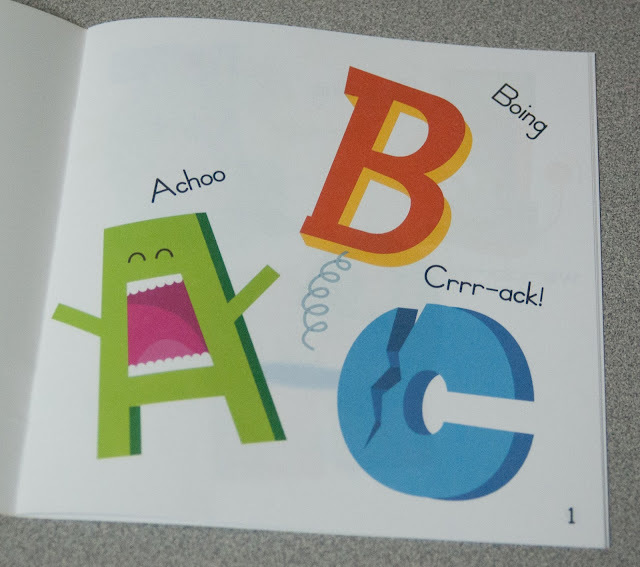 This months MGT book is the complete alphabet, each letter making a funny sound. Like page 1 includes A,B,C. A saying Achoo, B saying Boing and C Crr-ack. When it was just Lachlan and I, we got out the yarn and metal bolt that came in today's day bag. First I showed them to Lachlan and asked him, what could you make with these? He held them in his hands and tried to wrap the yarn around the bolt. Eventually he piped up "I don't know?" very inquisitively. So I took the yarn and tied it onto the bolt. Then I held the yarn and let the bolt sway. I started saying tic toc tic toc tic toc, just like a clock. You could see that it was starting to make sense to him. 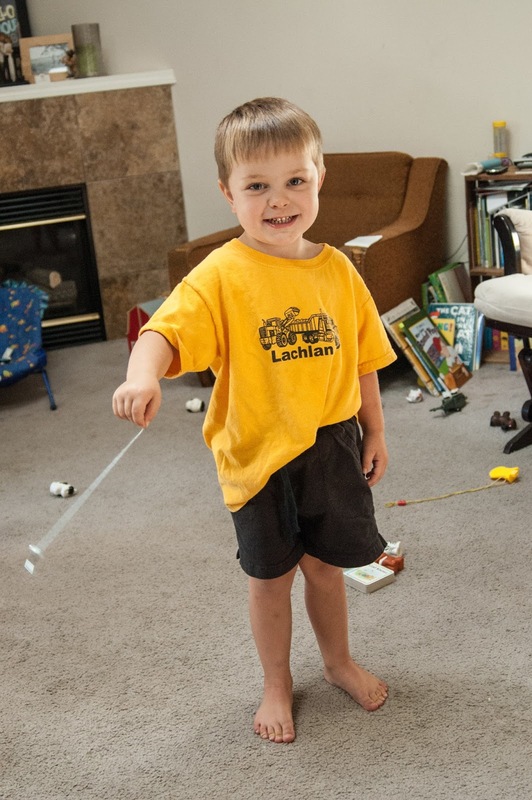 I told him it is called a pendulum. A pendulum swings and helps keep the time for a clock. He was excited to give this a try. 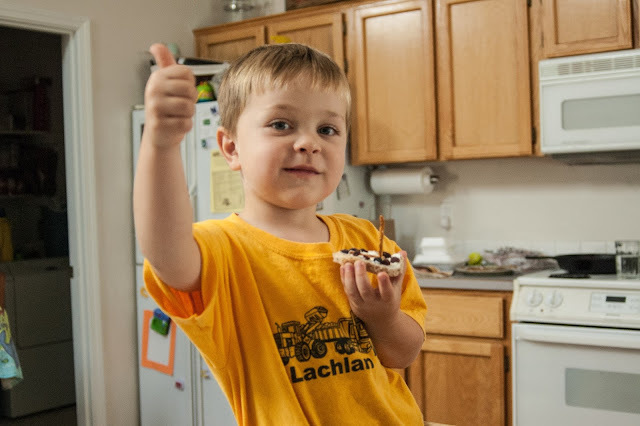 Next Lachlan and I made the Clock Snack. 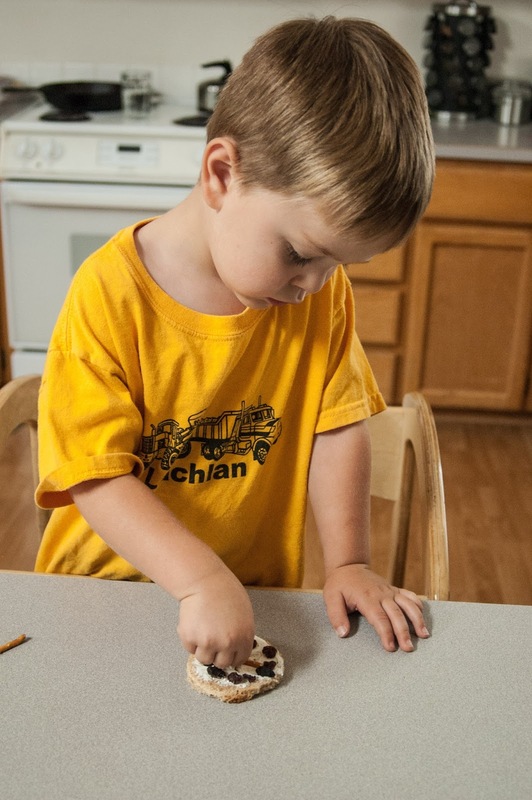 He hadn't eaten very well at lunch so it was time for a snack and this worked out perfect. First we washed our hands, then we had to cut out a circle shape from our bread. So we got out a glass from the cupboard. 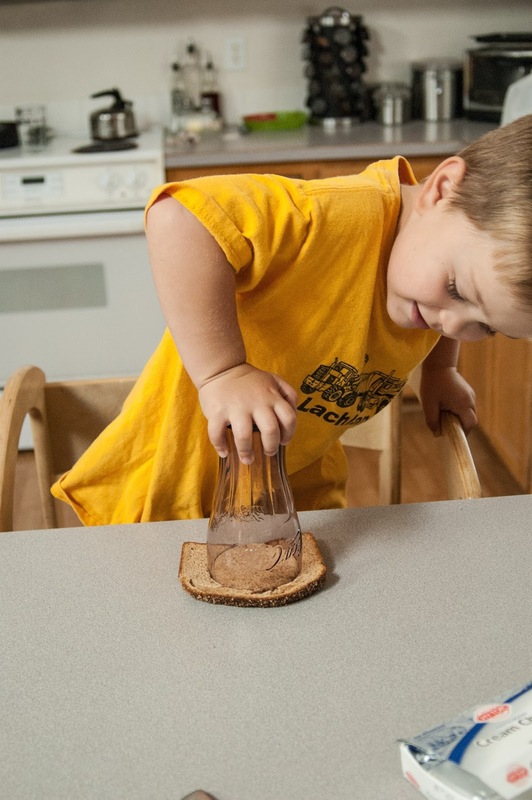 I asked him about the glass and if he could find any part of it that was a circle like a clock. He was a little stumped so I took my finger and traced the circle around the rim. Then I asked how he thought we might be able to use that circle cut out a circle in the bread. Again he was stumped so I tipped it over and placed the rim on the bread and told him to push down. 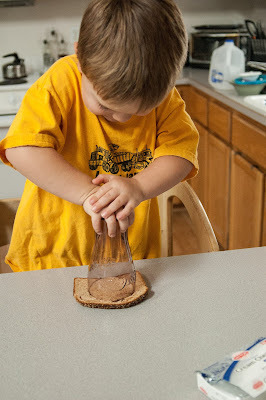 Once it was pressed into the bread we lifted it up and I helped him tear away the excess to get to the circle. Next MGT had us put cream cheese on the bread, then place raisins around the outside of the circle, 12 of them for each number on the clock. At the end we placed pretzels for the clock arms. This was great, I got to watch Lachlan do some problem solving. The pretzels were too long. 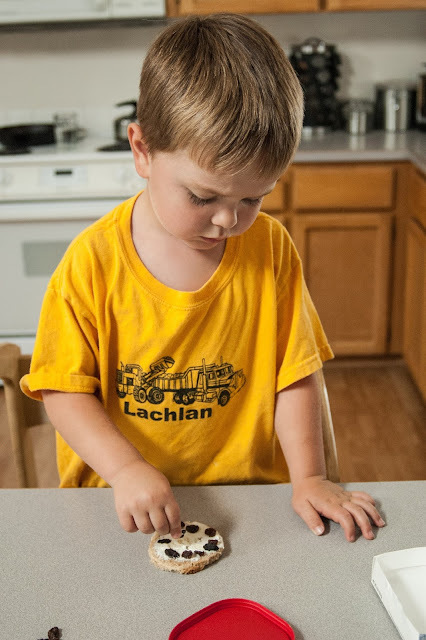 Lachlan tried laying one down and it didn't look quite right, so he picked it up and bit off a piece to make it shorter. Then he placed it on his clock. The second one he stuck in the bread sticking straight up, I figured he was making into a sundial and just let it be. He was proud of his creation and thought it was quite tasty, he at the whole thing. After Peter was awake again from his nap we got out the Drama Game. It was a cube that we taped together and rolled like a dice. Each side had something to act out. Like, pretend you are in a workshop. What tools do you use. Or, move as if you are a robot who needs oil. Peter got that last one a couple of times, it was pretty cute to watch his robot moves. I got them each to take a turn and then they were done. I tucked it away to try again later. They each took a turn again and then Peter got over excited and completely destroyed the poor cube. Oh well, we got some good fun out of it first. I keep meaning to give you on of my blank dice. You write on it with dry erase. That sounds awesome! What a great idea.